Dual therapy with aspirin and clopidogrel increases the risk of gastrointestinal bleeding. Therefore, co-therapy with a proton pump inhibitor (PPI) is recommended by most guidelines. However, there are warnings against combining PPIs with clopidogrel because of their interactions with cytochrome P450 isoenzyme 2C19 (CYP2C19). The effects of the combined or separate intake of 20 mg of omeprazole and 75 mg of clopidogrel on the clopidogrel-induced inhibition of platelet aggregation were measured in four healthy subjects whose CYP2C19 exon sequences were determined. The effects of co-therapy with 10 mg of rabeprazole were also examined. Two subjects showed the wild-type CYP2C19 sequence. The concurrent intake of omeprazole had no effect on clopidogrel-induced platelet inhibition in these subjects. Two subjects were heterozygous for the *2 allele, with predicted reduced CYP2C19 activity. One of them was a clopidogrel non-responder. In the second heterozygous subject, omeprazole co-therapy reduced the clopidogrel anti-platelet effect when taken simultaneously or separately. However, the simultaneous intake of rabeprazole did not reduce the clopidogrel effect. The clopidogrel-PPI interaction does not seem to be a PPI class effect. Rabeprazole did not affect the clopidogrel effect in a subject with a clear omeprazole-clopidogrel interaction. The separate intake of PPI and clopidogrel may not be sufficient to prevent their interaction. Dual anti-platelet therapy with aspirin and a thienopyridine (mainly clopidogrel) is recommended in the guidelines of national and international cardiology societies for patients with acute coronary syndrome and/or percutaneous coronary interventions. This combination is usually prescribed for up to one year. Therefore, the number of patients treated with this regimen is high. Unfortunately, this combination increases the risk of upper gastrointestinal bleeding. Therefore, most guidelines recommend that patients prescribed aspirin plus clopidogrel should also receive a proton pump inhibitor (PPI) to reduce the risk of gastrointestinal bleeding, e.g., the US guidelines  and the German guidelines . In the last two years, pharmacological studies have reported an interaction between clopidogrel and omeprazole. Subjects taking both drugs together showed a reduction in the clopidogrel-induced inhibition of platelet aggregation [3, 4]. The pharmacological basis of this phenomenon seems to be the competitive inhibition of cytochrome metabolism, especially CYP P450 2C19 (CYP2C19). Clopidogrel is a pro-drug requiring a two-step oxidation by hepatic cytochromes, including CYP2C19, 3A/5, 1A2, 2B6, and 2C9, to generate its active thiol metabolite . The key step in its conversion to the active anti-thrombotic agent is performed by CYP2C19. However, all PPIs are metabolized to inactive metabolites by CYP2C19 or other cytochromes to varying degrees [6, 7]. Polymorphisms of the cytochromes may play important roles in a patient's pharmacological response to clopidogrel treatment and the pharmacological interactions of this drug [8, 9]. Data-bank analyses and retrospective cohort studies [10–13] have demonstrated an increased risk of adverse cardiac events in clopidogrel-treated patients who also take PPIs (mainly omeprazole). However, subgroup analyses of randomized controlled trials [14, 15] and other studies [16, 17] have not confirmed the adverse effects of PPI co-therapy. Only one randomized controlled study has so far addressed this topic (COGENT). Unfortunately, this trial was stopped early, after the sponsor Cogentus Pharmaceuticals (Palo Alto, CA, USA) declared bankruptcy. The first reports from this study did not show evidence of a clinically relevant drug interaction . Based in this uncertainty, both the US Food and Drug Administration (FDA) and the European Medicines Agency (EMEA) have warned that omeprazole should not be combined with clopidogrel unless "absolutely necessary" (EMEA). The FDA warning also included esomeprazole. These warnings of the FDA and EMEA do not resolve, but indeed increase the problem for physicians treating patients who require dual therapies. Based on their mode of action via the irreversible inhibition of platelet and parietal cell functions, both clopidogrel and PPI are very potent and long-acting drugs. The active metabolite of clopidogrel irreversibly inhibits the platelet adenosine diphosphate (ADP) P2Y12 receptor through an inactivating disulfide bond, whereas PPIs irreversibly inhibit the proton pumps of parietal cells. However, the plasma half lives of both clopidogrel and PPIs are less than two hours. Therefore, several authors have recommended that the intake of the two drugs be separated to reduce the risk of their interaction [19, 20]. However, no data have yet been published on the efficacy of this regimen in preventing the clinically relevant interaction of PPI and clopidogrel. Other recommendations have suggested the prescription of a PPI other than omeprazole in combination with clopidogrel [21, 22]. However, few data are so far available on the differences between various PPIs in their potential interactions with clopidogrel activation. Pantoprazole [22–24] and esomeprazole [23, 24] but not lansoprazole  seem to have little or no pharmacological effect on the activation of clopidogrel. We studied the effects of both the separation of omeprazole and clopidogrel intake on platelet inhibition and the use of the PPI rabeprazole in a co-therapy with clopidogrel in four subjects whose CYP2C19 gene sequences were determined. Four healthy volunteers were studied. The study was conducted in a manner consistent with ethical principles based on the Declaration of Helsinki. Written informed consent was obtained from all study participants before study entry. After the baseline (day 0) platelet function of all subjects was measured, 75 mg of clopidogrel was given in the morning before breakfast for seven days without an initial loading dose. On day 7, two hours after clopidogrel intake, a blood sample was drawn for the analysis of platelet function, and 20 mg of omeprazole (Antra MUPS, AstraZeneca GmbH, Wedel, Germany) was taken. For the next six days, 75 mg of clopidogrel and 20 mg of omeprazole were taken together before breakfast. After seven days of the combined intake of clopidogrel and omeprazole, another blood sample was taken two hours after the administration of the medication (day 14). For the next seven days, clopidogrel was taken before breakfast and omeprazole was taken before dinner (the intake of the two drugs was separated by 12 hours). A blood sample was taken in the morning after the separated intake of clopidogrel and omeprazole (day 21) for seven days. No omeprazole was taken in the evening of day 21. Starting day 22, the subjects took clopidogrel and 10 mg of rabeprazole together before breakfast. Again, blood was drawn after seven days, two hours after the intake of the medication (day 28). Non-responders to clopidogrel were discharged from the study after the first week of clopidogrel intake. Subjects with no reduction in platelet inhibition in response to the co-therapy with clopidogrel and omeprazole were not investigated further. ADP-induced aggregometry is a widely used method of measuring responsiveness to clopidogrel. Whole-blood aggregation was determined with an impedance aggregometer (Multiplate Analyzer, Dynabyte GmbH, Munich, Germany). The system detects the change in electrical impedance attributed to the adhesion and aggregation of platelets on two independent pairs of silver-coated, highly conductive copper wires (length 3.2 mm) in the test cuvette. Therefore, two measurements are obtained as an internal control. For the analysis, 300 μL of whole blood anti-coagulated with hirudin (200 U/mL, Dynabyte GmbH) and 300 μL of 0.9% NaCl was stirred at 37°C for 3 min in a single-use test cuvette, and ADP (6.4 μmol/L; Dynabyte GmbH) was added. Pipetting was performed with an attached electronic pipette. The increase in electrical impedance was recorded continuously for 6 min. The areas under the curves (AUC) of the aggregation tracings are expressed as the mean values of two independent determinations. The results measured with the Multiplate Analyzer were reproducible, with less than 6% variability . The reference range of the test was 53-122 AUC [U]. DNA was extracted from EDTA blood using the FlexiGene DNA isolation kit (Qiagen, Hilden, Germany). All nine coding exons and the flanking regions of the CYP2C19 gene (GenBank: NT_030059.13) were amplified with a standard PCR, and analysed by direct DNA sequencing with BigDye v1.1 on an ABI Prism 3130 Avant XL (Applied Biosystems, Foster City, CA, USA). To describe the mutations, we applied the nomenclature used by the CYPalleles data base (http://www.cypalleles.ki.se; GenBank M61854.1). The primer sequences are available upon request. The gene sequences were analysed with the software Mutation Surveyor V3.10 (Softgenetics LLC, State College, PA, USA). Two subjects were found to carry the wild-type allele (allele *1) of CYP2C19 (subject #1 and #2). The other two subjects (#3 and #4) were heterozygous for the mutations c.681G > A; p.Pro227Pro, and thus carried the alleles *1/*2 (Table 1). No other reduced-function CYP2C19 allele was observed in this study group. Reduced CYP2C19 function was predicted for the subjects with the CYP2C19 wt/*2 genotype [8, 9]. In subject #1, the baseline platelet function was normal. 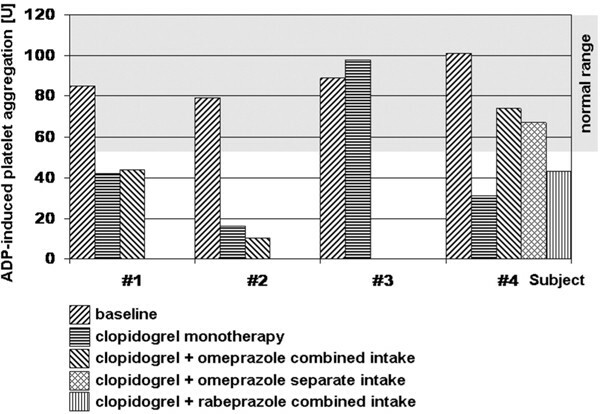 the clopidogrel-induced inhibition of platelet function was not influenced by the cotherapy with omeprazole (Table 2, Figure 1). therefore, according to the protocol, not further tests were performed. ADP-induced platelet aggregation in four subjects treated with clopidogrel with and without PPI co-therapy. The reference range of the test was 53-122 U. The reference range of the test was 53-122 U.
Clopidogrel intake inhibits ADP-induced platelet aggregation in subjects showing the expected clopidogrel effect. Normal platelet function under clopidogrel mono-therapy represents a non-responder status. The normalization of platelet function by co-therapy with clopidogrel and PPI after platelet function is inhibited by clopidogrel mono-therapy indicates a pharmacologically relevant drug interaction. *n.s., not studied, according to protocol. In subject #2, the platelet function was inhibited by clopidogrel mono-therapy, and platelet function was normalized when clopidogrel and omeprazole were taken together (value 58 U). because the subject suffered from diarrhoea on days 5 and 6 of the combined intake (presumably viral enteritis), this part of the study was repeated after his recovery and no effect of omeprazole co-medication was observed on clopidogrel-induced platelet inhibition (10 u; data shown in Table 2). Clopidogrel treatment did not the alter platelet function of subject #3, indicating a non-responder status. According to the protocol, no further tests were performed. In subject #4, co-therapy with omeprazole and clopidogrel normalized platelet function, indicating a relevant drug interaction. This interaction was not abolished by separating the intake of the two drugs. However, when rabeprazole was taken together with clopidogrel, platelet aggregation was inhibited to the range observed during clopidogrel mono-therapy. Two of the four subjects (#1 and #2) carried only the wild-type allele of CYP2C19. For both of them, cotherapy with 20 mg of omeprazole did not diminish the clopidogrel-induced inhibition of platelet aggregation, even when the drugs were taken simultaneously. The clopidogrel-PPI interaction may therefore affect only the subgroup of patients with genetic variants of CYP2C19 and not the three quarters of the white European population who are homozygous for the wild-type CYP2C19 allele . The findings in subject #2 suggest that an acute episode of diarrhoea may reduce the clopidogrel-induced inhibition of platelet aggregation. The most likely explanation is a reduction in gastrointestinal absorption of clopidogrel. Considering the high incidence of acute viral enteritis and the importance of dual antiplatelet therapy this phenomenon should be studied in more detail. Subject #3 was a clopidogrel non-responder, although she carried one wild-type allele. Because about 25% of the Caucasian population have the same CYP2C19 allele status wt/*2 , a large proportion of patients treated with clopidogrel may be non-responders. Therefore, it seems reasonable to test the clopidogrel-responder status of a patient who requires dual anti-platelet therapy rather than genotyping the patient. Subject #4 revealed the most important findings. The clopidogrel-omeprazole interaction was observed in this patient with a predicted reduction in CYP2C19 function. Co-therapy with 20 mg of omeprazole completely abolished the clopidogrel-induced inhibition of platelet aggregation. It is reasonable to assume that subjects with reduced CYP2C19 function are at increased risk of this interaction. The interaction was not prevented by separating the intake of the two drugs by 12 hours (clopidogrel in the morning, omeprazole in the evening). However, the simultaneous intake of 10 mg of rabeprazole and clopidogrel did not alter the effect of clopidogrel on platelet function. Although only demonstrated in one subject, this seems to indicate that the interaction between omeprazole and clopidogrel may not be a class effect of PPIs. This was also suggested by other studies [22–25]. Rabeprazole was chosen for this study because 10 mg of this PPI is as potent as 20 mg of omeprazole and more potent than 20 mg of pantoprazole in elevating the intragastric pH . Conversely, plasma levels of rabeprazole after an intake of 10 mg are lower than those measured after an intake of 20 mg of omeprazole or 20 mg of pantoprazole (these doses are necessary for the prevention of peptic gastrointestinal ulcer), minimizing the risk of a drug interaction with clopidogrel . Although these observations require confirmation in much larger trials, they suggest that clopidogrel should not be combined with omeprazole but with other PPIs, such as rabeprazole, if PPI co-therapy is necessary in patients receiving clopidogrel therapy. This conclusion is consistent with the recommendations of the FDA and EMEA. Although the separation of the intake of clopidogrel and omeprazole did not affect the interaction in one subject, it is still reasonable to adopt this strategy because it may be beneficial in other subjects. The only possible disadvantage of such separated intake of the two medications is reduced compliance. Therefore, patients must be informed of the importance of taking the medications. Considering the high prevalence of patients taking clopidogrel and aspirin and the need for gastroprotection, prospective randomized trials with clinical endpoints that examine the safest and most effective drug regimen are highly warranted and should be undertaken in the near future. Until more clinical data are published, the prescription of a non-omeprazole PPI and the separation of drug intake are preferable, although the effect of separating the intake of the drugs is unsubstantiated. This study was not supported from any pharmaceutical company and performed without any financial support.